As our vineyards show more maturity so does our wine. The medium bodied 2014 vintage has a soft and supple palate, with light and pure red fruit characters. Garnet in colour, the wine offers opulent aromas of strawberries and cherries and hints of forest floor. The oak influence, as always, is subtle and understated, supporting the fruit driven profile of the wine. To enjoy it fully we suggest you decant the wine at least an hour before drinking and serve at 16-18˚C or as a light red for summer you can serve it at 10-12°C. It can be enjoyed with a variety of foods; such as a mushroom risotto, duck and game dishes or simply on its own. This was the wettest and toughest vintage Seven Springs’ / Hermanus had and it was one on the wettest around the world. Floods and heavy rains throughout the winter, leading to lots of underground water for the vines. Summer canopies were lush and beautiful because of all the excess water, but this summer was hot and humid and not windy at all, which is customary in the Western Cape. This lead to very high disease pressures in the vineyards but gave rise to high yields. 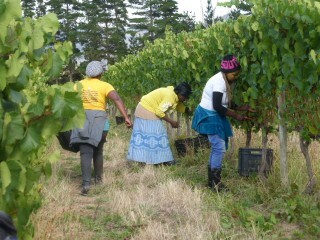 This was the vintage where the viticulturists had to show their skill. The quality of wine was determined by the health of your vines and our viticulturist Peter Davison knew his stuff. The cooler regions and white wines were the least affected by the bad weather. The worlds best Pinot Noir is reputed to result from the selection of clones; a common practice in Burgundy. Clones 777 and 828 are currently favoured in addition to the reliable 114, 115 and 667. These clones are known for their strong colour, elegant rich aroma with hints of small fruits. They give the wine structure and potential for ageing. Seven Springs selected four clones: 777, 667, 115 and 459, planted in 2008, on the warmer north facing slope at 240 meters elevation on Bokkeveld Shale with decomposed granite and deep, rich yellow and red clay subsoil.